None of the literature on diesel fuel disproves the benefits of filtration. This process helps to get rid of dust and dirt particles that can penetrate into supply system through nozzles. It is caused by periodic opening and closing of the fuel tank. When channels and spray nozzle holes are clogged, insufficient amount of fuel is supplied to the combustion chamber, resulting in reduced engine power. Purified fuel burns out more efficiently, emits less toxic gases, increases engine power and reduces fuel consumption. Filtering is necessary to protect friction surfaces and other fuel system components from solid contaminants. Filters that are composed of a housing and a filter element are typically used for this purpose. Filter elements can be made of synthetic fibers, cellulose or special paper. Various parameters can be used to describe the effectiveness of a filter. One of the most significant parameters is the maximum particle diameter that can pass through the filter. The so-called filtration beta-rate is also used in practice. It involves estimation of the ratio of certain size particles amount in the fuel upstream of the filter to the amount of the particles downstream of the filter. The higher the beta-rate, the better the filter efficiency. The challenge is to select the correct filter to remove impurities of a certain size. Otherwise the filter will not function. Currently you can find filters that can remove not only solid particles but also water contained in fuel. Such devices require constant attention because water overflow can cause the device to lock, as a result of which contaminated fuel will flow past the filter element. Separation is, in fact, a form of filtering. It is used when fuel is contaminated to such an extent that an ordinary filter cannot cope. The main advantage of separators is the ability to remove impurities, even in high concentration. There are models that can remove both solid particles and water from fuel. Separators are combined devices by the mode of functioning: They combine mechanical and chemical principle of operation. First, the fuel is freed from solids and water in a centrifuge; they are collected at the bottom of the bowl and only then filtered through paper, impregnated with a special substance. Such substances possess the ability to bind water emulsion, which 20-25 times exceeds their own weight. Separators are a good solution if the fuel is heavily polluted, but they also require very complex maintenance. Use of additives is a fundamentally different approach to the improvement of diesel fuel. Its essence is to improve only some individual characteristics of fuel by addition of special chemicals. When selecting an additive, one should always remember that even the most high-quality product may still have some negative properties. That is why the attitude of drivers and managers of large fleets to additives is not unambiguous. The most useful and effective additive formulations help prevent the proliferation of bacteria and micro-algae in fuel. They are suitable for use when fuel is stored in a tank for a long time. Bear in mind these additives do not improve indicators such as viscosity, cetane number and lubricity. Anti-wear additives are used to prolong the life of fuel system, improving the lubrication properties of diesel fuel. These are used with low sulfur diesel fuel. There is also a group of additives to increase the cetane number which improves engine starting characteristics at low temperatures, as well as vehicle performance. In general, additives that increase the cetane number do not affect any other properties of fuel, except for lubricity. At high lubricity the use of such additives is not so critical, but with medium or low lubricity it can cause accelerated wear of engine components, and in some cases nozzle damage. Depressors are designed to improve the low temperature properties of diesel fuel. Their effect is based on reducing paraffin solidification temperature, thereby improving the filter point of fuel. When selecting this type of additives, you should be aware that it is not capable of preventing stratification of fuels during storage at low temperatures. Other additives are mixed with fuel together with depressants to form very fine paraffin crystals, which do not precipitate, but are uniformly distributed throughout the volume of the fuel. Detergent additives are the most commonly used. Their popularity is due to their ability to remove various deposits or impurities. Older engines have sludge and varnish deposits on the walls, which adversely affect fuel combustion and increases toxic emissions. Detergent additives help to avoid these effects and slightly reduce the consumption of diesel fuel. Filter + additives = is peaceful coexistence possible? If a filter is designed to operate with certain types of fuel, using additives does not guarantee fuel properties required for effective filtering. Sometimes additives are separated from fuel during purification, which makes the use of such additives meaningless. Therefore, the combined use of additives and filters must be approached wisely and carefully: it can have an unexpected harmful effect. Companies involved in the sale of petroleum products pay much attention to marketable appearance of diesel fuel. As a result of long-term storage and exposure to air, diesel fuel can be oxidized and darken, which is not a good thing for sales. When dealing with medium and large volumes of fuel, use the UVR-type plants by GlobeCore. They can clarify dark petroleum products, remove odor, water and mechanical impurities. The plant allows to remove hydrogen sulfide compounds, reduce sulfur concentration, lower wax content and remove unsaturated hydrocarbons. After purification and clarification the fuel does not oxidize or darken again. Versatility. 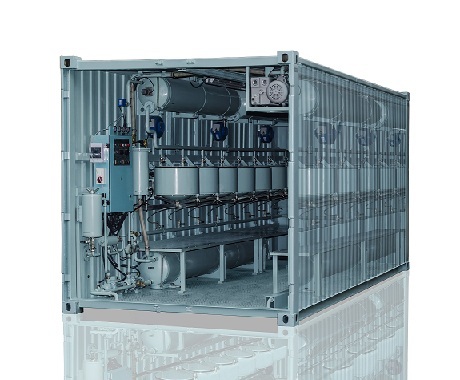 The UVR-type plants can be used to clean and restore not only diesel fuel, but gasoline, kerosene, heating oil, light mineral oil etc.